The conquest of Toledo in 1085 by the Castilian monarch Alfonso VI triggered a cascade of transcendental consequences in the political and military evolution of al-Andalus, and Cordoba. The most immediate were the advent of the Almoravid armies and the subsequent conquest of the Andalusian territories by this North African empire of religious foundation. From that moment Al-Andalus is preparing to face the threat of Christian conquest and the seasonal campaigns of looting in Islamic territory. Wall of the Axerquia in its northeast sector, according to George Vivian (1888). Cordoba suffered a military occupation in 1091. Although initially encouraged by the Maliki scholars or sages, the Almoravid government was never well received by the Andalusian population. Their presence was justified by the suppression of illegal taxes and their advance against the Christian front, but when these two pillars were lost there were important conflicts in society. An episode that illustrates this problem took place in 1121, when the Cordovan population revolted against the Almoravid governor, and Emir Ali ibn Yusuf himself had to go to Cordoba to reverse the situation. During this period the capital continues to play an important role in al-Andalus, but we have not been able to appreciate major changes from an archaeology point of view, largely due to the problems of identifying the general archaeological record of this period, one of the pending subjects in the Andalusian archaeology. However, in the official sphere, important actions can be distinguished, as seen in the construction and renovation of the Alcazar baths and in the extension of the Axerquia wall. The sources mention the imposition of a payment (ta’tib) by Emir Ali ibn Yusuf for the reconstruction of the walls of the main cities of al-Andalus. An archaeological performance in the Ronda del Marrubial allowed to discover the foundations of this structure, dated by the excavators during the first half of the 12th century, and with a slightly divergent orientation with respect to the layout of the later Christian site of the 14th century. The last years of the Almoravid occupation were altered by the “second taifas”, during which the Cordovan population moved between several opposing factions until they fell temporarily into the hands of the Castilian King Alfonso VII in 1146, who kept it under vassalage until the Almohad conquest in 1148. After years of instability under the control of the “Rey Lobo” from Murcia, Ibn Mardanish, the Almohad empire managed to get definitively with the city in 1162; date in which the first Caliph, ‘Abd al-Mu’min, converts again Qurtuba in the capital of al-Andalus. Within the Almohad propaganda, the election of Cordoba as Andalusian headquarters was fundamental in the legitimation of this new caliphate. However, this new capitalism lasted only a few months, since after his death, his son and successor, Yusuf I, returned power to Seville. However, this change did not stop the resurgence of the city, seat of the Maliki Andalusian tradition and spearhead in front of the Christian kingdoms. General plan of the late Islamic Cordoba (LEON, BLANCO 2012). The historical and geographical situation of Cordoba gives it a significant role. The proof is the ex-novo building of several fortresses in key points of the city, especially in the vicinity of the fortress: the head of the bridge is surrounded by an enclosure in tapial (or rammed earth) and a whole citadel is created west of the Alcazar, to which it would belong the one known for Christian sources such as Castillo Viejo de la Juderia. The Alcazar itself undergoes notable interior renovations, such as those that can be detected from the plaster and coffin decorations recovered during the excavations in the Baños del Campo Santo de los Martires or in the Patio de Mujeres of the Christian Alcazar, and showing a powerful remodeling of the internal development of this building during the Almohad government. They also erect a palace outside the walls, the Qasr Abi Yahyà. The sources comment that it was located on the Guadalquivir river and supported by a structure of arches; Although there are some hypotheses about its exact location, to date there is no clear archaeological data. 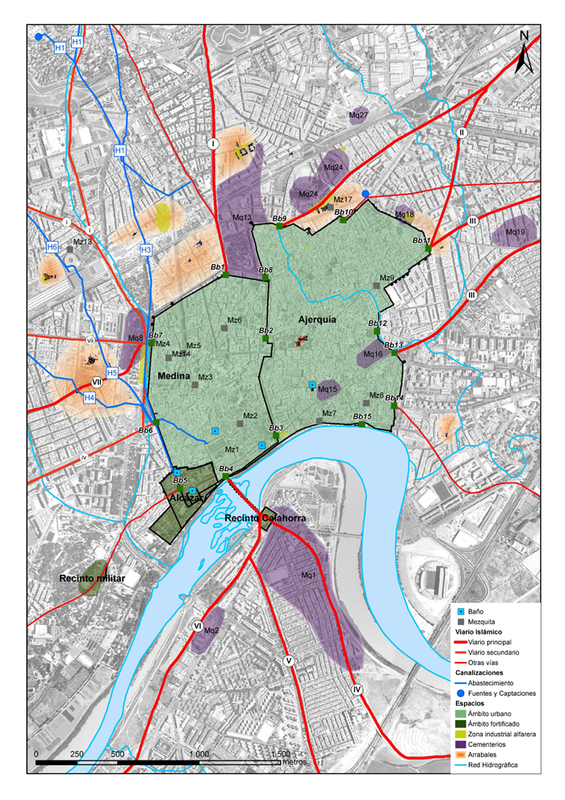 Probably the security of the unitary government, as well as the strategic and ideological weight that the city is acquiring, propitiates a recovery of the economic activity and an increase of the population in the second half of the 12th century. This fact translates into a densification of the city within the walls; especially in the Axerquía, as it shows the residential district excavated in the Huerta of the Orive Palace, with important houses decorated with rich parietal paintings. But also outside the walls, several neighbourhoods appear on the ancient Umayyad ruins, such as the one born next to the pottery production sector of the Avenida de Ollerias, the residential / productive area discovered around the current Rectorate of the University of Cordoba, the production space for oil in the archaeological zone of Cercadilla, or the luxurious housing district located north of the current Avenida de Ronda de los Tejares, next to the northern wall of the Medina. This last one could correspond with the neighbourhood of the Mosque of Kawtar that they pick up the Arab sources for century XII. The rest of the city would still maintain the main religious and civil buildings erected from the Umayyad intramural period, as well as part of the inherited funerary spaces. 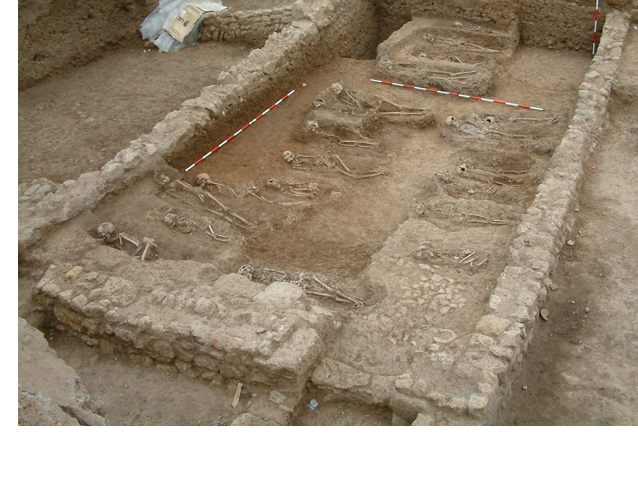 Excavations of the Almohad and pottery district of Ollerias, (LOPEZ JIMENEZ 2006 en LEON, BLANCO 2012). Such urban expansion seems to be ephemeral, since between 1180 and 1190 these peri-urban sectors are abandoned according to the recovered ceramics. 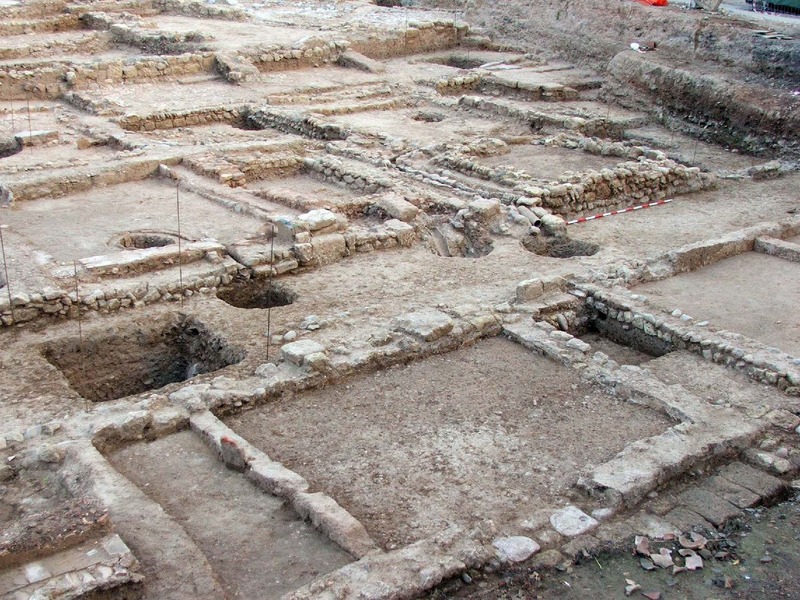 In addition, in most cases there is a rapid and violent abandonment of the same, as evidenced by the strata of ashes, the fragments of weapons found in domestic environments or, for example, the graves discovered in the Ollerias neighborhood pottery: they documented children, women and the elderly with evidences of violent death, willing and oriented correctly, but located unusually in one of the warehouses of the alfar. Very surely they are indications of the strong presence of Christian troops in the Cordovan periphery, verified in the sources from 1182. Burials that amortize an old warehouse in the pottery district of Ollerias(LOPEZ 2006 en BLANCO 2014). On these same dates a walled enclosure would be built on top of the hill of the Quemados, according to the remains documented in the current Zoological Park, with tapial walls and quadrangular towers that could delimit an enclosure destined to the large Almohad troops, and that It would also allow monitoring the space outside the walls and, especially, the south-western environment of the city and its Alcazar. The descriptions that the Christian sources have transmitted to us at the time of the conquest, which occurred in 1236, already portray a declining Islamic city, especially after the defeat of the Almohad Empire in 1212, after its boom, and again broken the political unity of the Andalusian territory. BLANCO GUZMÁN, R. (2008): “Algunas precisiones sobre la Qurṭuba tardoislámica. Una mirada a la arquitectura doméstica de al-Rabaḍ al-Šarqī”, Anales de Arqueología Cordobesa, 19, pp. 293-322. BLANCO GUZMÁN, R.(2009): “Madīnat Qurṭuba tras la fitna. Una aproximación a través de la historiografía”, Spal, 16 (2007), pp. 41-51. BLANCO GUZMÁN, R. (2014): “Córdoba y el califato almohade, una aproximación arqueológica”, en CRESSIER, P.; SALVATIERRA, V. (eds. ): Las Navas de Tolosa, 1012-2012, Miradas Cruzadas. Universidad de Jaén, Jaén, pp. 499-508. BLANCO GUZMÁN, R. (2014): “La Córdoba tardoislámica y su arquitectura doméstica”, en SABATÉ, F.; BRUFAL, J. (dirs. ): La Ciutat Medieval i Arqueologia. VI Curs International d’Arqueologia Medieval. Lleida, pp. 381-397. ESCUDERO, J. et alii (1999): “Las murallas de Córdoba (El proceso constructivos de los recintos desde la fundación romana hasta la baja Edad Media)”, en Córdoba en la historia. La construcción de la urbe. Córdoba, pp. 201-224. FUERTES SANTOS, M.C. (2006): “Córdoba durante el siglo XII. El abandono y ruina de los arrabales occidentales y su reconversión en espacio agrícola e industrial a través de las excavaciones de Cercadilla”, en VAQUERIZO, D. y MURILLO, J.F. (Eds. ): Homenaje a la Profesora Pilar León Alonso, Vol. II. Córdoba, pp. 439-462. GARCÍA BUENO, A.; MEDINA FLÓREZ, V.J. 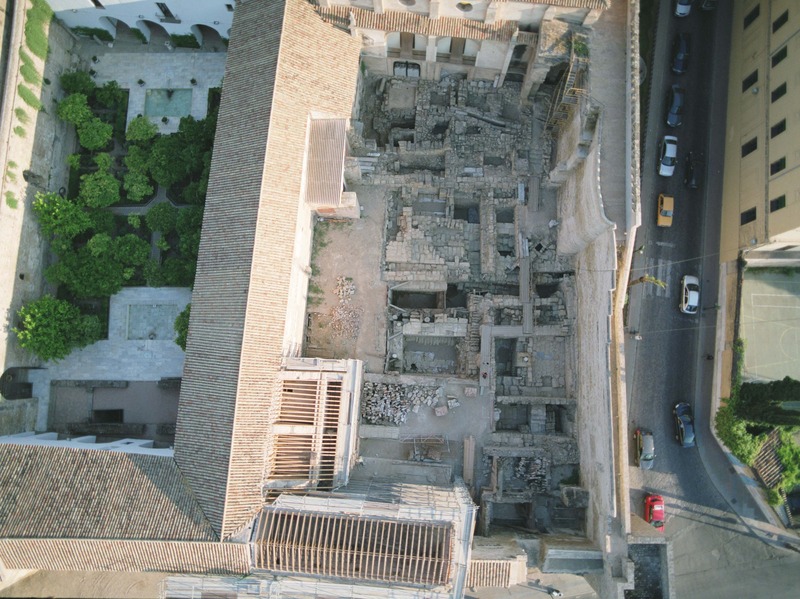 (2001): “Zócalos hispanomusulmanes en el Palacio de Orive”, en Anales de Arqueología Cordobesa. 12, pp. 113-139. LEÓN MUÑOZ, A. (2013): “Las fortificaciones de la Córdoba Almohade”, en Isabel Cristina F. Fernandes (coord. ): Fortificações e território na Península Ibérica e no Magreb (séculos VI a XVI), Lisboa, Edições Colibri/Campo Arqueológico de Mértola, vol. 1, pp. 337-354. LEÓN MUÑOZ, A.; BLANCO GUZMÁN, R. (2010): “La fitna y sus consecuencias. 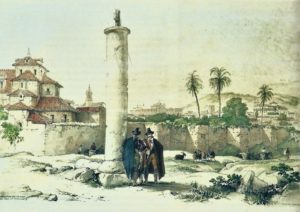 La revitalización urbana de Córdoba en época almohade”, en VAQUERIZO GIL, Desiderio; MURILLO REDONDO, Juan Francisco: El anfiteatro romano de Córdoba y su entorno urbano. Análisis arqueológico (ss. I-XIII), vol. 2, pp., 699-726. LEÓN, A. et alii (2004): “Informe-Memoria de la I.A .U. en el P.A. SS-4 (Entorno de la Torre de la Calahorra ) (Córdoba) ”, en Anuario Arqueológico de Andalucía 2001 , III/Actividades de urgencia, Sevilla, pp. 244-257. MURILLO, J.F. et alii (1995): “Intervención Arqueológica en el Palacio de Orive”, en Anuario Arqueológico de Andalucía 1992 , III/Actividades de urgencia, pp. 175-187. 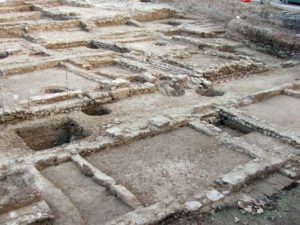 SALINAS PLEGUEZUELO, E. (2012): La cerámica islámica de Madinat Qurtuba de 1031 a 1236: Cronotipología y centros de producción. Tesis doctoral, Universidad de Córdoba. Dir. : Prof. Dr. Desiderio Vaquerizo Gil y Prof. Dr. Alberto León Muñoz. “En línea” (28/10/2012; http://helvia.uco.es/xmlui/handle/10396/7830). ZANÓN, J. (1989): Topografía de la Córdoba Almohade a través de las fuentes árabes. Madrid.